VIENNA – Chancellor of Austria Sebastian Kurz welcomed Western Balkan leaders to a working breakfast in the context of today’s Viena Economic Forum. The meeting was attended by Prime Ministers of all six countries of the region except from Zoran Zaev. Also present were Johannes Hahn, European Commissioner for Enlargement Negotiation and Neighbourhood Policy and Mariya Gabriel, European Commissioner for Digital Economy and Society. The main topics of the meeting were European perspective of the Western Balkans, which is also one of the key points of Austrian EU Presidency, regional cooperation and bilateral disputes. Prime Minister of Serbia Ana Brnabić pointed out that Kosovo violated CEFTA Agreement two weeks ago by imposing tariffs on goods from Serbia. “It is not in accordance with CEFTA and represents a clear discrimination. We hope that we’ll be able to implement this Agreement, which will enable us to continue the talks on what we can achieve together”, she explained. She thanked Chancellor Kurz on the fact that Austria has set EU enlargement high on its list of priorities, and expressed hope that further negotiation chapters will be opened, which would be an important signal for Serbia. Prime Minister of Kosovo Ramush Haradinaj stated that Pristina’s decision to impose tariffs was a consequence of a long lasting unfair tratment of Kosovo’s goods by Serbia and Bosnia and Herzegovina. “Not one product from Kosovo was able to enter Serbia and Bosnia and Herzegovina without financial hurdles. On the other hand, we have a good cooperation with other countries. We are ready to strengthen our relations with all neighbours”, he said. Haradinaj also reflected on visa liberalisation with EU, adding that Pristina is ready for it, but that there is no readiness in EU to reach a decision about the issue. Prime Minister Haradinaj asked Austrian Chancellor Sebastian Kurz to put the issue of Kosovo visa liberalisation on the agenda of the Council of European Union. “Apart from our right on freedom of movement, liberalisation would mean more partnerships for Kosovo and more market opportunities for exchange between EU countries and the region”, Haradinaj concluded. According to him, Pristina fulfilled all necessary conditions and has a “full capacity” for realising visa liberalisation, and Prime Minister of Albania Edi Rama supported Pristina’s request. 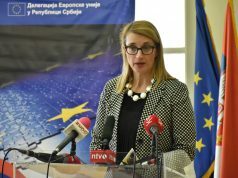 “I hope that visa liberalisation with Kosovo will be implemented at least after the European Parliament elections”, said Rama. Chancellor Kurz emphasised that Austria is a strong partner on region’s European path, and that Vienna’s position is that EU will not be complete without Western Balkans. “We know that the European stability is connected to security and stability in your region. This is why all Western Balkan countries need to follow the EU path”, said Kurz. 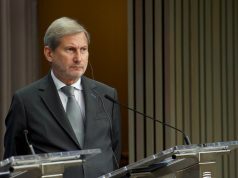 European Commissioner Johannes Hahn said that EU enlargement is one of the three key priorities of Austrian EU Presidency, which is very important. At the same time, he pointed out the importance of Western Balkan’s integration into the common market. This is why it is necessary to “remove all barriers, both formal and informal”. “The volume of trade cooperation within the region needs to increase. From 2016 to 2017 we had a moderate growth, which is a promising trend. 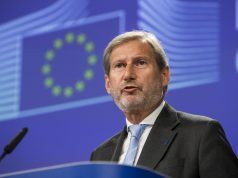 In the past ten years, the trade of the region with EU has doubled”, stressed Hahn. He emhasised that all six countries have a European perspective, adding that it is a merit-based process. “That means that not everybody will be able to access the Union together, but it is importnat that all the countries have a perspective”, said Hahn. Chairman of the BiH’s Council of Ministers Denis Zvizdić confirmed that his country is strongly committed to EU integrations. 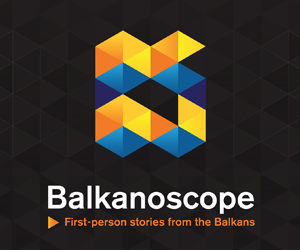 It is currently answering the additional questions of European Commission and the next Presidency will hopefully visit Brussels with the finalised answers, which would mean that BiH has fulfilled all conditions for getting a candidacy status.